We are a leading manufacturer, wholesaler and supplier of deluxe camera straps with pre-printed cool themes. The Ez-adjustable camera straps can be adjust to (cut to) fit your length easily. Any custom length welcome ! A variety of selection of deluxe camera strap material, colors or imprinting are available with different style of metal or plastic hardware attachments. You can add-on variety of small items by using our camera universal strings. We manufacture large quantity of pre-printed cool theme camera straps with manufacturers' low cost to camera owners. Custom camera strap manufacturing services available for camera manufacturers or packaging companies. 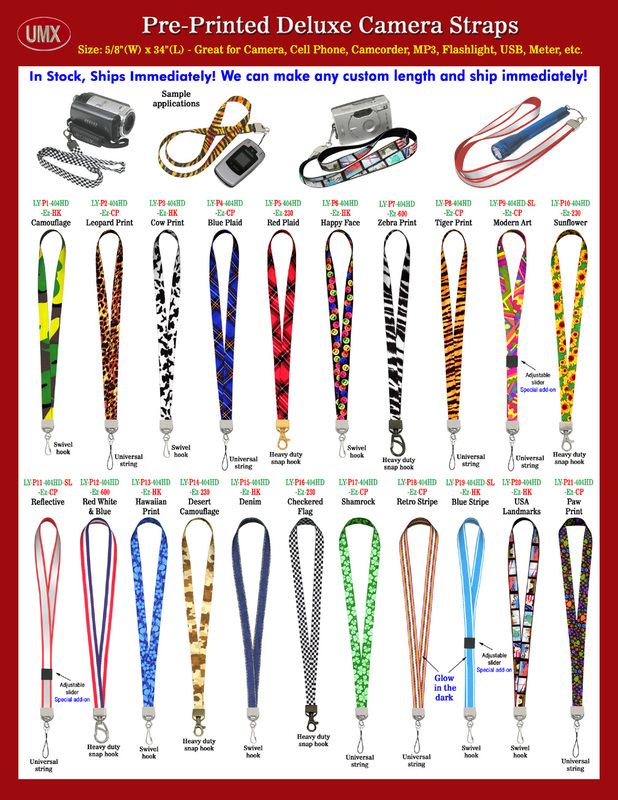 You are viewing Lanyards > Strap Supplies > Ez-Adjustable Deluxe Camera Strap Supplies and Camera Strap Manufacturers.